Have you seen that “nature photo challenge” that’s going around on Facebook? I’ve been nominated by [beloved friend] to participate in the 7-Day Nature Photography Challenge. I’ll post one photo each day for seven days and will nominate one (lucky) person each day to pass this along, so we can flood Facebook with beautiful photos of nature. Today, I nominate [name of next victim] to continue the challenge (but only if you want to, and only if you have time). … and this one, of the magnificent Ely Cathedral in England. I’m glad you asked. The technique I’m about to describe is called “composite photography,” and basically consists of blending several frames to create a single image. Pretty fancy, eh? And the good news is that it’s easier than you might think. The steps I’ll describe in this tutorial use Photoshop, but I’ve also listed some other photo-merge options at the end of the post. Shoot several frames until you’ve captured your entire subject. Make sure to overlap some of the content among successive frames, and shoot plenty of content around the periphery so you can crop the image later. Including a distinctive object in your composition (like, say, a lady in impossibly red pants) helps Photoshop work a little faster and more accurately. 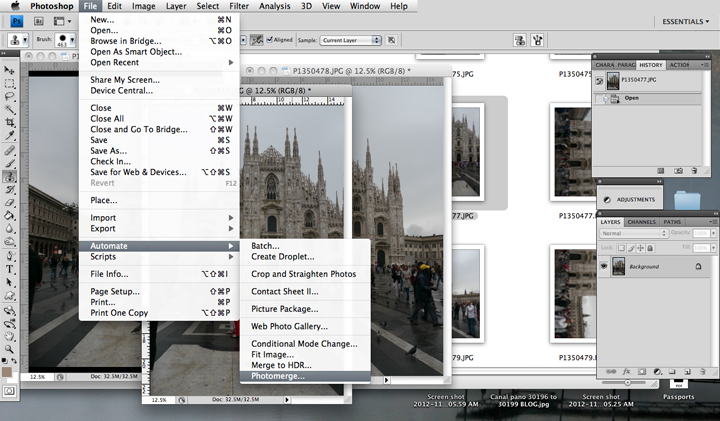 In Photoshop, open the files you want to merge. 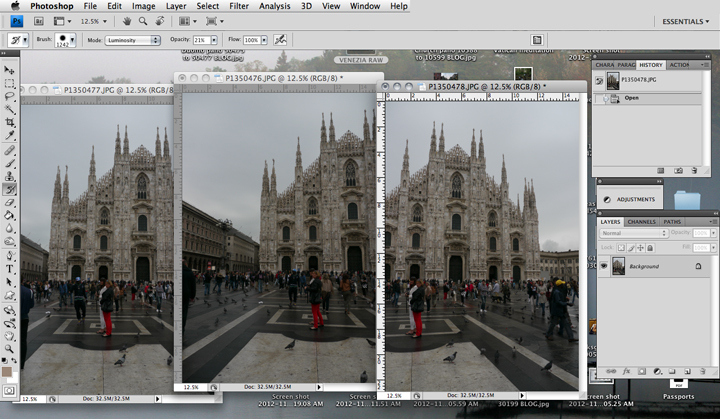 Then go to File > Automate > Photomerge. Depending on your computer and the number/size of your files, Photoshop may take a minute or two to work its magic. Go grab a cup of coffee and congratulate yourself for being so clever. 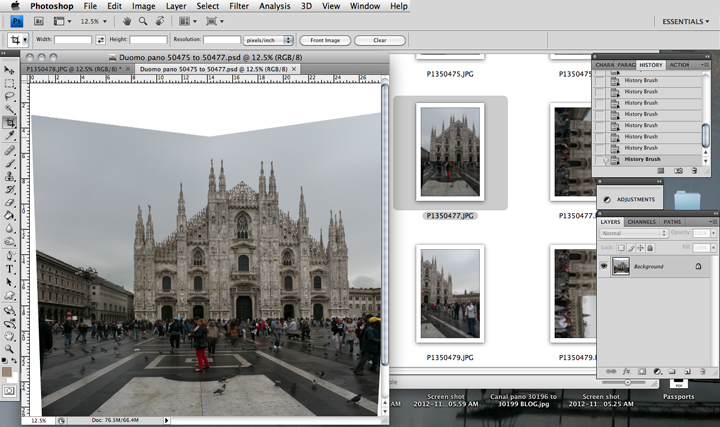 As you savor your delicious coffee, you’ll soon see a composite of your photos. If something is misaligned simply choose the portion of the image in question and jostle it around until it looks right. 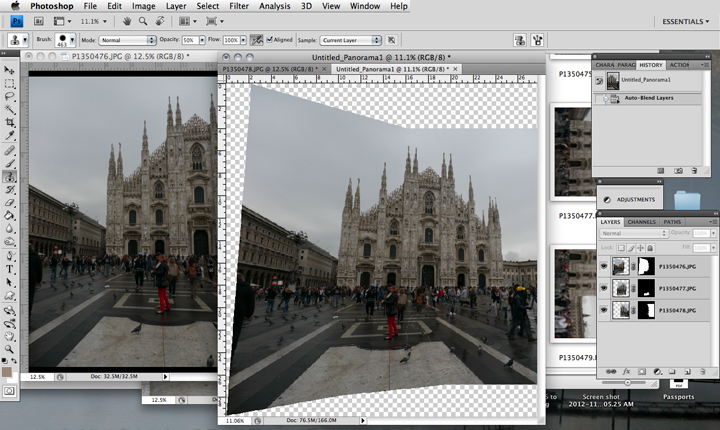 Otherwise, flatten the image into a single layer. 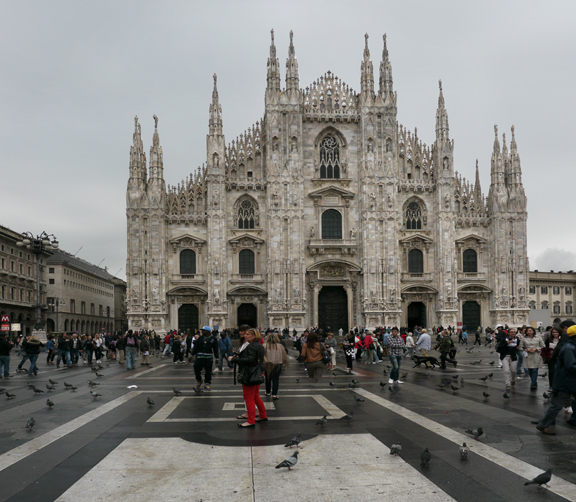 Your image may look a little distorted, especially if you shot the individual frames from different vantage points. 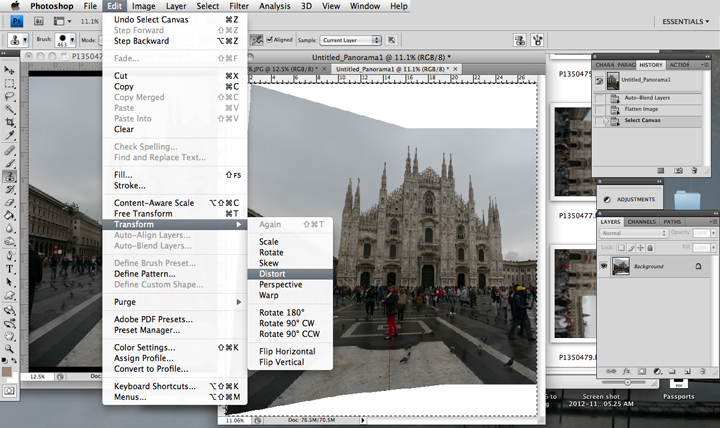 Select the entire image and use either the “distort” or “warp” tools to correct any perspective problems. Once you’re satisfied with the perspective of your image, crop it and save it to your desktop (or other favorite workspace). This is just a suggested workflow, of course. 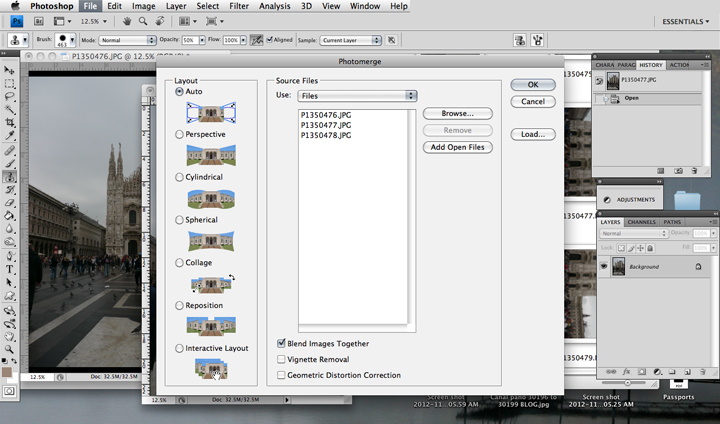 There are a million other ways to create composites — including several kinds of dedicated software such as acropano, easypano, panavue, PTGui, and Autostitch. Many camera manufacturers also include some sort of stitch function in their proprietary software, and smart phones are increasingly offering that feature built-in, too. But no matter which method you use, I hope this post will inspire you to get out there and photograph your world. Thanks H, I printed this to try out. I’ll be eager to see any results you care to share, Tom! Thank you very much, Andrea. After doing it by hand for years, I was surprised to learn how easy it is in the newer versions of Photoshop. Thank you for stopping by! Thank you! If you try it, please consider posting your photo(s). I’d love to see how this works for other photographers too. Cheers!